It is very hard to generalise about “alternatives”, as the term encompasses such a wide range of asset classes and investment strategies. At Franklin Templeton (FT), we broadly think of alternatives as those investments that aim to provide diversification from traditional asset classes such as bonds and equities, and to protect capital in down markets. Correlation (or more strictly speaking the lack of it) is often cited as a measure of how alternative an investment is: low correlation to equities and bonds makes a good “alternative”. However, we believe that simple correlation is too linear a measure, and what really matters is how an investment performs in up and down markets, respectively. An asymmetric relationship, whereby up markets are captured (positive correlation) and down markets are avoided, or ideally exploited, (low or negative correlation) would seem to be the holy grail of investing and truly alternative to traditional investments. Why the rise in alternatives? The growth in alternative assets generally and hedge fund assets in particular over the past decade has been driven by institutional investors who invariably cite diversification benefits as the primary reason for making an allocation. This demand is driven by a number of factors, including short-term macroeconomic considerations, as well as long-term secular changes in the way in which investors think about their portfolios. As such, this is a trend that we expect to continue and which could result in “alternatives” being considered far more conventional than is currently the case. In the short term, we believe recent market events have inevitably contributed to the demand for alternatives. After 30 years of strong fixed income markets, and global equities at or near all-time highs, asset allocators have to think hard about how to position their portfolios for the future. For example, the search for yield over the past few years has steadily driven investors to look for opportunities further up the credit curve and down the liquidity spectrum in order to generate sufficient income. Strategies like insurance-linked securities or bank loans, that were once the purview of a select group of niche investors, are now making regular appearances in the portfolios of pension funds and other mainstream institutional investors. However, it is not just the short-term considerations that are driving the growth in alternatives. As defined-benefit pension schemes mature, cash-flow matching becomes increasingly important, and this in turn is likely to support demand for cash-flow-generating assets. Investments that produce attractive long-term yields, particularly if they offer some form of inflation protection and yield expansion such as real estate, private debt and infrastructure, are likely to be useful tools in an asset-liability matching programme for the foreseeable future – even if we see interest rates eventually return to more normalized levels. Although a perfectly matched book is the end goal for most defined benefit pension schemes, many are currently significantly under-funded. This means that, in the absence of substantial capital injections from the schemes’ sponsors, growth-targeting assets will remain an important component of their asset allocation decisions. However, many scheme sponsors will often have an asymmetric risk attitude to the possibility of the scheme’s funding level deteriorating. In other words, the risk of deterioration in the scheme’s funding level potentially has substantially worse consequences for the sponsor than the benefit of an improvement. As such, an investment that potentially aims to capture a substantial portion of market upside while protecting capital in declining markets may be more attractive than one that captures all of the market gains but with a commensurate amount of the losses. Another factor contributing to the rise of alternatives is the institutionalization of the alternative investment management community. Improved governance, risk management and client communication, as well as investment in infrastructure, have made it easier for institutional investors to gain confidence in alternative strategies. With greater transparency from managers, investors are increasingly able to think of alternatives as an extension of, and complement to, their traditional holdings. There is a clear trend of sophisticated institutional investors moving away from using hedge funds generically, as a means for overall portfolio diversification, andmore as a means for targeting specific sources of return with desired risk/return characteristics. Moreover, an allocation to a long/short credit fund, for example, could easily be considered as part of an institution’s fixed income book, as it could part of an overall “alternatives” portfolio. As investors have become more sophisticated in the way that they employ alternative strategies, so the alternative industry has had to adapt to meet this demand. The most obvious manifestation of this is the consolidation seen in the fund of hedge funds universe and the shift in demand from commingled towards customized portfolios, tailored to play a specific risk/return role in the context of an investor’s overall portfolio. In Franklin Templeton’s Solutions business, not only do we have demand for customized portfolios of hedge funds, but we are seeing growing interest in multi-asset portfolios, managed to specific return and risk characteristics, incorporating traditional assets, systematic risk premia and alternative investments. Putting all of these considerations together, we see the hallmarks of a long-term secular trend of convergence between traditional and so-called alternative asset management. For most institutional investors, real estate is typically the largest component of their alternative asset allocation, followed by private equity and hedge funds. In real estate, core markets have performed very well recently and prime property is starting to look fully valued. Investors are gradually beginning to look at value-added and opportunistic strategies that have the potential to increase future income and profit from the strong core market. Demand for private debt is currently quite high, largely coming from pension funds seeking long-duration assets to offset their liabilities. Given the current level of yields available in public debt instruments, investors who are comfortable with the illiquidity feel that the risk/reward proposition of private debt is more attractive. As banks globally continue to de-lever, the availability of assets should continue for some time, but ultimately the interest on these investments has the potential to wane once we return to more normalized interest rate policies. Demand for infrastructure assets is strong too, and this is a theme that is likely to continue given the attraction of very long-term inflation-linked income for pension schemes. Within hedge funds strategies, long/short equity has been in high demand. This is partly due to the improved investment environment for the strategy as correlation between stocks has declined and markets have become less dominated by top-down macroeconomic factors. Furthermore, investors looking to rotate their portfolios out of traditional long-only credit, while at the same time wanting to avoid investments with a high dependency on the direction of equity markets, have also stimulated demand. Global macro also continues to be popular, despite the lack of clear trends in markets. Much of this popularity is down to the diversification aspects that potentially come with a macro allocation, as the strategy can perform well in trending markets (whether up or down). Event-driven and activist strategies have also seen a lot of investor interest. Strong corporate balance sheets are increasing the frequency of corporate events such as share buy-backs, spin-offs, special dividends, etc., broadening the opportunity set for event managers. At K2 Advisors, FT’s hedge fund specialists, we are less keen on merger arbitrage though, as the weight of competing hedge fund capital in the space is creating an unusually efficient market and therefore lowering the return potential. In the activist arena, corporate management teams are broadly responding well to manager-led campaigns to improve capital allocation, executing asset sales and business divestitures, and/or completing other cost-cutting measures to create shareholder value. Given events over the past few months, it may seem a somewhat contrarian opinion, but in both private equity and hedge funds we believe that some of the best opportunities probably lie in emerging markets right now. The geopolitical environment and the uncertainty around the global economic recovery are inevitably going to cause periods of significant short-term volatility, but with this comes opportunity. In particular, at times of market stress, emerging markets tend to get lumped together as a bloc, but this treatment ignores the fact that there are substantial differences between the economic prospects of different emerging countries. As such, we currently believe that there are plenty of highly attractive investments both on an absolute and relative basis. We believe that what has been true of traditional emerging markets has been even more the case in certain frontier markets where structural transformation at the country level has set the stage for substantial growth, in our view. The opportunity for credit re-rating and currency revaluation is providing some highly attractive risk/reward propositions in these markets. We believe an investor can often be well paid to wait for market revaluations to take effect, a scenario we expect to see in some of these countries in the future. However, more often than not, given the small size of these opportunities, a position may only have an impact in the context of a smaller fund. And the challenge for most small funds is that the research effort involved to invest confidently in some of these markets would be prohibitive. So, choose your manager carefully! “Alternative” investments are often associated with relatively lower volatility returns, but they are clearly not without risk. The media and public often see alternatives, especially hedge funds, as risky largely because of historical blow-ups. A lot of these blow-ups were the result of operational and risk deficiencies in a developing hedge fund industry. The industry has matured appreciably in the last few years and we believe these risks are now lower. Liquidity is an obvious area where investors should pay close attention, as is style drift. Ultimately, in our opinion, risk management of alternatives comes down to appropriate levels of transparency. Operational due diligence on an alternative investment has always been extremely important and, in the post-Madoff era, some form of transparency from managers is now a prerequisite. However, investors need to ensure that the transparency they receive is sufficient to judge the investment they make and the role it is meant to be playing within the context of their overall portfolio. By demanding greater transparency, investors can readily evaluate and monitor risks like liquidity and style drift, but can also gain greater insight into how well the investment fits into the portfolio as a whole and whether it is fit for the purpose underlying their original allocation decision. In the wake of the global financial crisis, alternative asset managers have faced significant changes in the regulatory environment in which they operate. Greater global regulatory scrutiny has the potential to be a tremendous force for good for the alternatives industry by making some very useful investment tools available to investors, enabling them to build well-diversified portfolios and produce better risk-adjusted returns. But, if the regulatory environment becomes too restrictive, European investors may be denied access to investment opportunities that could ultimately be to their disadvantage. The alternatives industry has seen significant asset inflows in the past few years. Theory dictates that large quantities of money flowing into any single market opportunity ultimately will exert downward pressure on performance. But “alternatives” are not homogenous, so the picture is not so black and white. Certainly some areas of alternatives look to have limited upside right now, such as core real estate where prices have risen considerably and the differential between core and secondary properties is unusually wide. So, in real estate, for example, a generic exposure may be undesirable, and it may be more interesting to look at, say, value-added strategies that target specific, local opportunities in an inefficient segment of the real estate market and capitalize on the strong core property market. Looking at hedge funds, there have been substantial inflows, but again, hedge funds are not a homogenous asset class. Indeed hedge funds are not an asset class at all. Many hedge funds operate in niche, esoteric areas, and the number of such opportunities, if anything, is rising – whether it be in frontier markets or developing technologies. In addition, markets are increasingly displaying signs of greater dispersion, which should in turn increase the opportunity for alpha generation through long/short and relative value strategies. That said, the biggest alternative fund managers have received the lion’s share of the inflows. 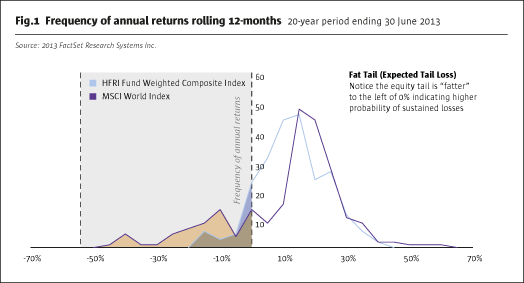 So although industry inflows per se don’t necessarily diminish the expected return from alternatives collectively, given the niche nature of most alternative strategies there is a danger that some of the very large funds may become over-diversified and ultimately produce less compelling risk-adjusted returns. So, it really boils down to “caveat emptor”. Alternatives are not homogenous and different alternative strategies will be more or less attractive at any specific time. Investors should be clear what risk premia they are targeting through their alternatives allocation and how excess returns are being generated. As well as trying to identify the most attractive aspect of the range of alternative investments, investors must also think about how and who is best placed to capitalize on it. Where returns are being predicated on niche opportunities, a large fund may not be the best way to access them. The growth in alternatives has hitherto been driven by institutional investors who largely have been the only group able to invest in offshore domiciles efficiently and accept the reduced liquidity such vehicles typically offer. More recently, the Alternative Investment Fund Managers Directive (AIFMD) and the considerable changes in regulation have made it difficult for even some of these European investors to access certain alternative investment strategies. However, with an increasing array of “liquid alternatives”, with weekly, if not daily liquidity available, these investments are becoming more widely accessible. As more and more managers become comfortable with the UCITS format, we are likely to see an increase in fund launches to meet this pent-up demand. In addition, the ongoing switch from defined benefit (DB) to defined contribution (DC) pension schemes is likely to drive further demand as DC schemes typically require daily liquidity. As alternative strategies become more commonplace and investment techniques more transparent, so the sources of returns will become better understood. Investors will be able to determine how much of a strategy’s return is a function of an “alternative beta” (i.e., the systematic capture of risk premia) and how much is due to manager skill (alpha). This process will in turn put pressure on fees, as cheap alternative beta products become available and mediocre managers are unable to hide behind readily replicable techniques. Alpha will remain the ultimate prize for investors and the challenge for an expanding industry will be to retain the niche investment focus of the boutique funds that cradled the industry while developing the infrastructure and scale to deliver across multiple distribution channels and service clients cost-effectively.